Dimensions 0 by 7 by 9 in. Focusing on early social media in the arts and humanities and on the core role of creative computer scientists, artists, and scholars in shaping the pre-Web social media landscape, Social Media Archeology and Poetics documents social media lineage, beginning in the 1970s with collaborative ARPANET research, Community Memory,Â PLATO, Minitel, and ARTEX and continuing into the 1980s and beyond with the Electronic CafÃ©, Art Com Electronic Network, Arts Wire, The THING, and many more. 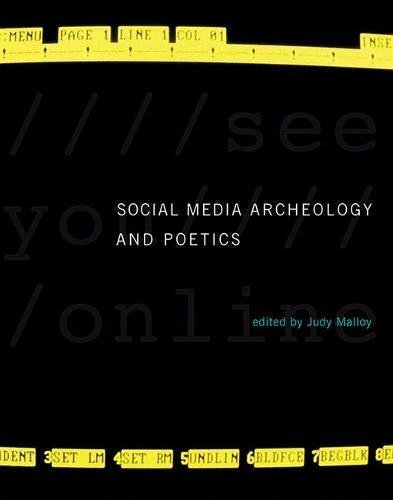 With first person accounts from pioneers in the field, as well as papers by artists, scholars, and curators, Social Media Archeology and Poetics documents how these platforms were vital components of early social networking and important in the development of new media and electronic literature. It describes platforms that allowed artists and musicians to share and publish their work, community networking diversity, and the creation of footholds for the arts and humanities online. Anditinvites comparisons of social media in the past and present, asking: What can we learn from early social media that will inspire us to envision a greater cultural presence on contemporary social media?